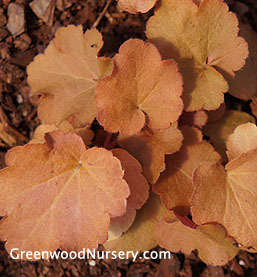 The Caramel Heuchera is a coral bells native to the U.S. Northeast. This shade loving plant will lighten up woodland gardens, under the canopy of larger growing trees, and on the shaded side of your house. New growth of the Caramel Coral Bells is apricot fading to a soft amber over summer only to turn salmon red in fall. Caramel Heucheras bloom in spring with creamy white blooms. Plant in moist shade or dry shade. The Caramel shows tolerance to heat and humidity and grows nicely in the southeast.